Henry Ford was one of those youngsters who was fascinated by anything that ticked. He was obsessed by the mechanical workings of pocket watches and windup toys and his brothers and sisters had to be on the lookout or he would have them apart trying to figure out how they worked. There was one thing that separated him from most in that he "usually could put them back together again." The obsession with anything mechanical never waned. Not long after his mother was lost in childbirth, a devastating loss for such a young man, twelve-year-old Henry spotted "A steam engine [that] was traveling along the road under its own power." This amazing sight was more than enough to capture his imagination for a lifetime. Later, when he invented his quadricycle, people simply considered him to be an odd duck and called him "Crazy Henry." He was far from crazy and many others were amazed by his talents. He was having trouble breaking into the automobile industry, but while others were experimenting with an electrical "horseless carriage," he was experimenting with a gas-powered vehicle. When this was pointed out to Thomas Edison, a lifetime friendship was born when he shouted out, "Young man, that's the thing: you have it. Keep at it . . . Your car is self-contained--it carries its own power plant--no fire, no boiler, no smoke and no steam. You have the thing. Keep at it." And that he did. In this book you will get a glimpse at the life of a man who was determined that the automobile would shift from being a "luxury item for the well-to-do to a necessity for the average American." You'll learn about his family life, the formation of his company, the manufacture of the Model T, the creation of the innovative assembly line, how he shared his good fortune with his employees (the $5.00 day), you'll learn about his "Peace Ship," his brief political career, his commitment to the "broader community," his pacifism, his biases, and much more. Did you know that he hired African Americans during "a time of great racial discrimination"? This is an excellent photobiography of Henry Ford, a man who "believed in equal opportunity" long before it was popular. It will not take long for the reader to become totally immersed in this excellent biography. There are numerous photographs, many that I've never seen, that simply speak for themselves. The amazing advances in technology began with the likes of Henry Ford and Thomas Edison, two close friends who challenged each other with their work. This biography not only gives an overview of Henry's "automobile" life, but also gives the reader a feel for his personality. In the back of the book is an index and additional recommended book and web site resources to explore. 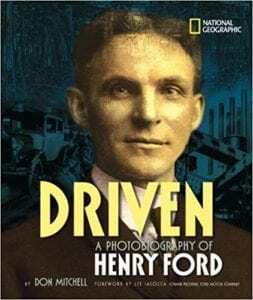 Quill says: Driven: A Photobiography of Henry Ford is an excellent resource for the pre-teen (ages 9-12) reader.